Jake Downs is one of Australia’s premier voice actors. For more than 20 years his voice has driven successful campaigns for The Summer and Winter Olympic Games, The Commonwealth Games, Woolworths, Coca-Cola, Foxtel, Fosters, Tooheys New, Brut, Commonwealth Bank, St George, Bankwest, The Wallabies, The Socceroos, The A-league, and The NRL to name but a few. Jake is also an accomplished actor and presenter. 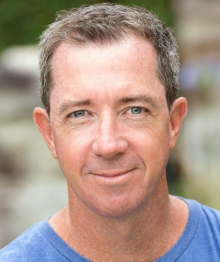 Over the last decade he has earned lead roles in TVCs for the likes of the RTA, Sun Herald, Supercheap Auto and St George. Most recently Jake has featured in a global multi-media campaign for Microsoft. Jake’s presenter roles include a branded internet series for Volkswagen and training products for Westpac, Optus, GIO and the Royal Australian Navy. Jake Downs = awesome. Not only can he can interpret a script he can turn it into something amazing. From the man in the street, humorous to hard sell – Jake brings it home every time. Here at ARN we are producing spots for three different radio brands and genres. Jake’s unique style sits perfectly across all three. He’s great to work with and brings total believability to every read. Jake can do the everyday man voice, but so much more. He’s up for anything, follows direction like a pro and is always a good vibe. Often, when I’m writing an ad that requires an Aussie bloke who screams sincerity and believability (sometimes with a comedic twist) and a down to earth vibe, I catch myself impersonating Jake in my head. My version is rubbish, but the point is, Jake is that voice, the guy who can tell other guys about tools and have them shelling out to replace theirs. The guy who can tell mums what painkiller is best for their kids and have them wondering “What the hell was I thinking with tablets? Gel caps are the answer.” On top of this, Jake is on time; every time, warm, smiley, amazing with clients and professional to a T. He’s one of the greats – and he’s more versatile than you think! beer with him and get him to spin another yarn. When you need more Russell Crowe than Russell Crowe. Sam Yeomans - Head of Broadcast Y&R Group. Jake is a great go to man who delivers enthusiasm, interpretation and clarity in equal measure. Time and time again he has gone above and beyond to fit in with tight time lines together with a cool head. He moves effortlessly between an urgent retail read and a more measured emotional performance.